My wife has beautiful green eyes and she has always been very careful with them, looking after them all the time. I noticed this and -being myself- could not avoid mentioning this to her early on during our married life as I thought she was exaggerating… She is a very tolerant lady and patiently but firmly explained that her eyes were her most important asset. I did not ask again and made sure that her eye drops were always handy! 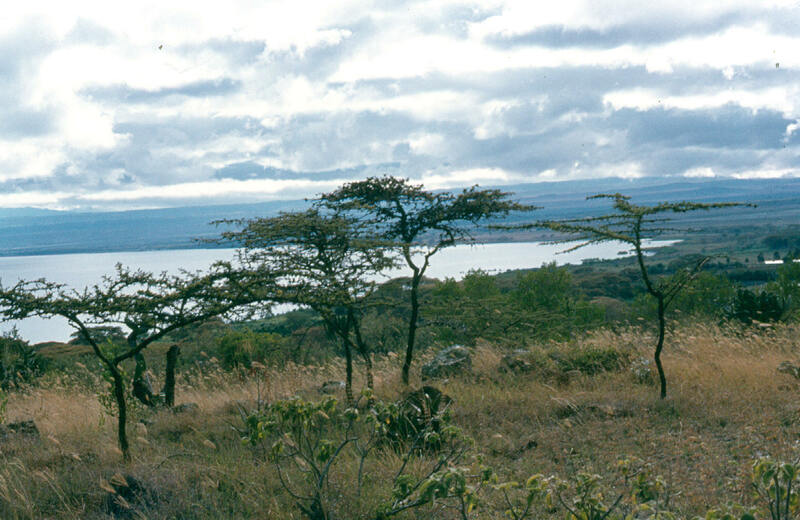 Lake Naivasha in the distance. While in Kenya in the eighties, on a Saturday we decided to travel to lake Naivasha to spend the weekend at the lake shore at Fisherman’s camp (http://www.fishermanscamp.com/) on our first outing to the area. It was a beautiful drive down the Kikuyu escarpment, passing by the Longonot volcano and the little church built by the WWII Italian prisoners. 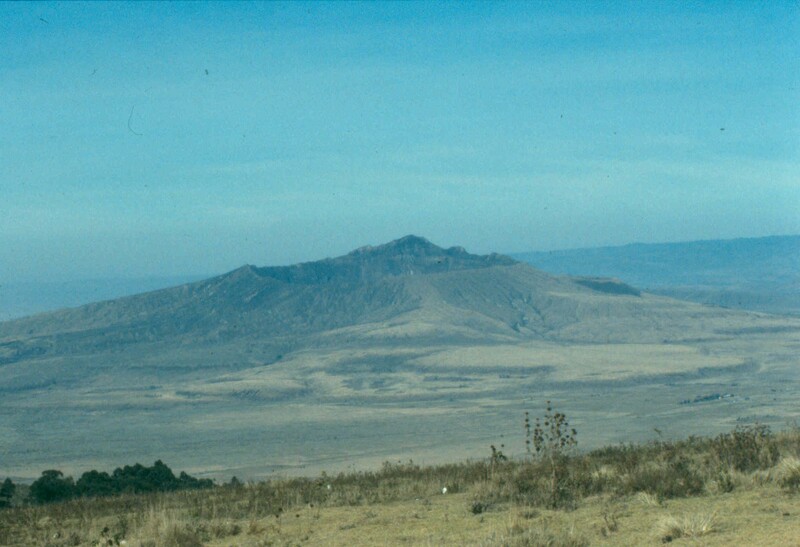 Longonot Volcano in the Rift valley. Then, the magnificent Rift Valley came into view, with lake Naivasha glimmering in the far end (see first picture, above). Once at the bottom of the valley, we crossed Naivasha town and then followed the lake shore road for about 20 km to reach the camp. At the time the road crossed mainly private farms and cattle ranches. It was mid-morning and I was enjoying the drive in our loyal Volkswagen kombi, taking in the great landscape when I heard: “There was an antelope up a tree!” announced in a rather calm way. I did not react immediately as it was a ridiculous announcement. I was about to ask my wife to pour some more water on her head as it was clearly overheating when she reacted to my indifference with “I am not joking, there is an antelope there!! 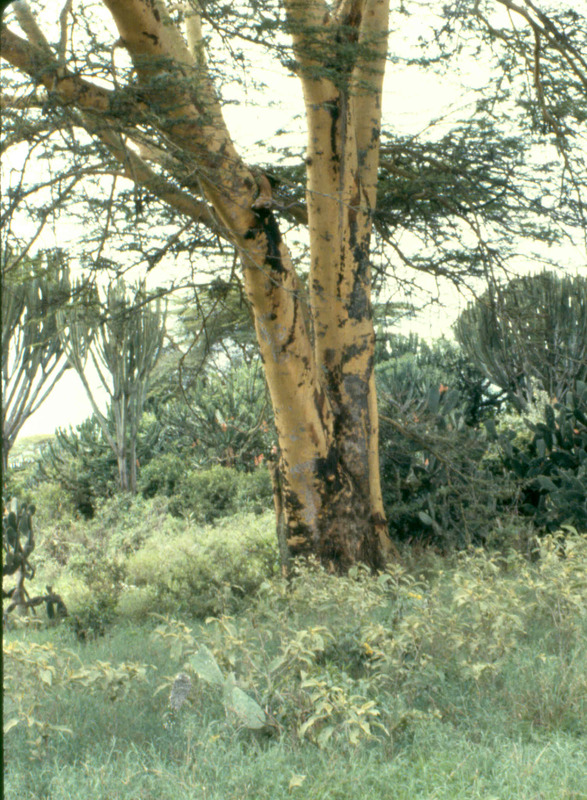 !” She was pointing at a yellow barked acacia about 100 m from the road, on our right. I stopped the car and looked. I could see the acacia well but that was that. I reversed, still incredulous, until I parked in front of the tree. Following the directions given and with the aid of my 8 x 40 binoculars I managed to identify the head and neck of a male impala placed across a branch. A view of the tree with its unlikely inhabitant. Please note that this is already a close-up view! The expected “I am glad that you believe me now” followed. My immediate thought was that it was either placed there by a farmer to attract and kill a leopard or by a leopard! Neither were visible nearby as we were alone on the road. As the situation clearly demanded further investigation, we got out of the car and walked to the tree. 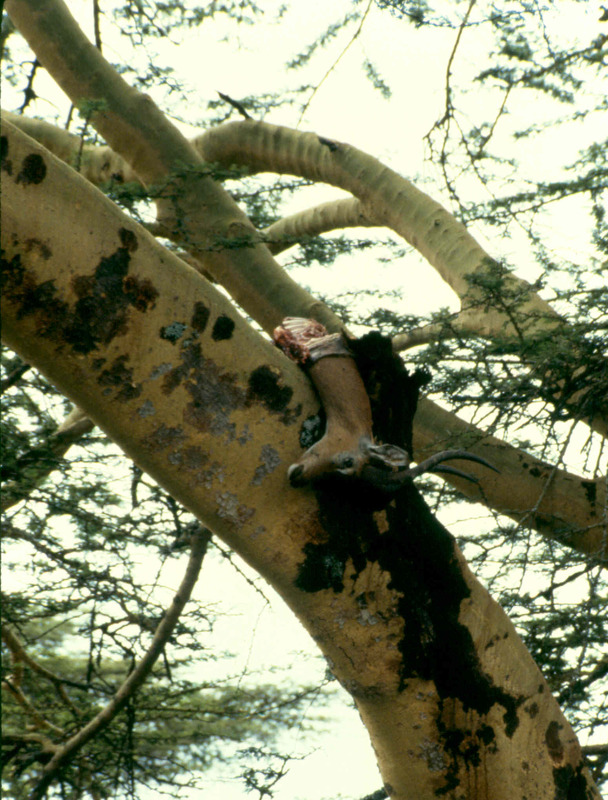 Although half eaten, the impala was quite fresh and it was probably killed and placed there the night before. The question was solved -at least to our satisfaction- by finding deep claw marks up the tree trunk where the reddish inner part of the trunk was visible where the yellow and velvety bark had been removed! On closer inspection, the impala was clearly visible. After taking pictures we proceeded to the camp with great excitement and speculated on the finding. Our holiday break now clearly influenced by the find, we agreed to return to the tree at dusk to see if the impala owner would come back to the kill. We kept our secret and at about 18:00 hours we set off to sit and wait by the tree. We were prepared for a long wait so we took our dinner and drinks with us, parking the car at a secluded place to avoid being too noticeable to passers by. None of the cars or pedestrians that happened to pass by ever saw anything! To my eyes that knew that the kill was there, this now seemed impossible! Our wait lasted until midnight but to our disappointment, the leopard did not come back. Tired of the wait, bored and sleepy, we returned to the camp. We spent a great Sunday exploring the lake shore until it was time to get back to Nairobi before dark. The carcass was no longer there when we passed by in mid-afternoon. Further inspection of the tree trunk showed additional paw marks and bits of fur were also found in the bush nearby. 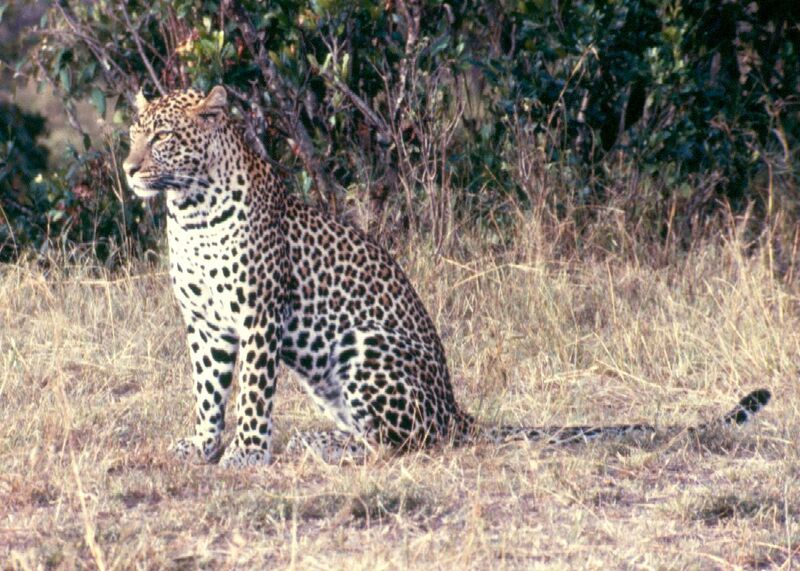 The secretive East African leopard pictured at the Maasai Mara Game Reserve. This was the first demonstration of my wife’s keen eyesight. I have shared safaris and game viewing with lots of people and I can assure you that she rates among the best! If there is an animal on a game drive, she will find it!